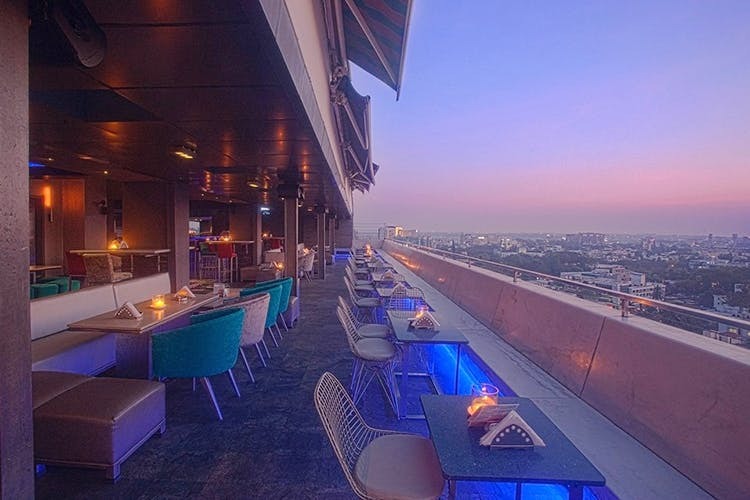 A great hotspot that’s been around since the 90s, 13th Floor was and is one of the best places to be if you’re looking for a drink with a stellar view of the city. It’s all about the ambience here! It’s high on nostalgia as it was one of the first places in the centre of the city that brought together good music (Rock in those days and Commercial now), pan-Asian food and views of Bangalore. But for new city-dwellers, it’s a really lovely place to soak up the balmy Bangalore air. And the view? It’s still spectacular. Easy breezy is exactly what 13th Floor is. Being quite high up, get there early enough to get a table that is actually outside on the balcony area. If you can’t make it, the covered but open space isn’t too bad either. You don’t really go here to party, but be it a date or an evening with friends, this place is upbeat and eclectic. Food is borrowed from the sister concern Ebony and On The Edge. We love the DIY Burmese Khaoswe and The Devil and Some Cheese – fries loaded with cheese and drizzled with a super spicy sauce. Parsi food also sells like hot cakes, especially the Mutton Dhansak. Hit up this place in a group, the platters are great to nibble at, and they’re available in both vegetarian and non-vegetarian options. We also suggest you try the Malabar Martini – gin shaken with coconut water, curry leaves and Thalassery peppers. We love watching the sunset here with a cool mocktail or cocktail in hand. It gets very crowded on most weekend nights and so service can be a bit slow, especially since the staff can’t hear when the music is blaring. Use dumb charades on Friday and Saturday nights to communicate with the wait staff. You’ll save your voice and sanity! We suggest visiting on weeknights since they are peaceful and you can enjoy some downtime and appreciate the city from the top.